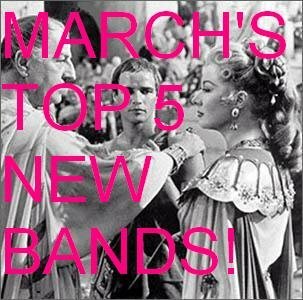 >March’s Top 5 New Bands! >There was no ‘Best Of’ list for February. No, we can’t work out why either. It’s safest to lie and brag that here at ANBAD, we don’t play by your insignificant ‘rules’, but truthfully, I think it just got forgotten. Sorry, February’s bands. Coming in April: ANBAD’s birthday celebrations! We are 1! Posted on April 6, 2009 by Joe Sparrow. This entry was posted in Today's New Band and tagged Round Up. Bookmark the permalink. ← >ANBAD Benevolent Overlord Internets Robot Strikes Again! >The ANBAD Time Machine – March ‘09! | A New Band A Day!